Before I was a book blogger, I was a food blogger. It’s true. Mr. O and I ran a humble blog (not modesty—the photography was mostly mine, which is to say, poor) about our cookery for a couple of years, which we both loved, but eventually fell by the wayside (baby, digestive disease, the usual). Point is, I love food, so I hope you’ll indulge a turn from the literary and toward the culinary this week. I read cookbooks for fun, and the only thing I truly miss about having cable is the cooking shows. 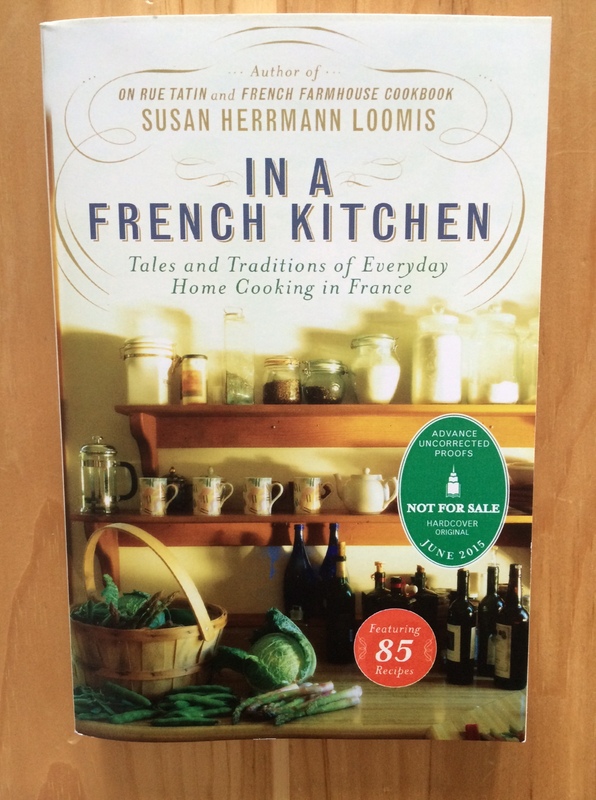 So when Susan Herrmann Loomis’s In a French Kitchen: Tales and Traditions of Everyday Home Cooking in France* arrived, I was ready to sink my teeth into it. It’s a cheerful book about traditional French home cooking, accompanied by recipes that fit in with the theme of each chapter, like salad, cheese, grandmotherly cooking, pantry staples, even leftovers. The food sounds absolutely mouthwatering, but what’s even more fun to read about are the gustatory and cooking habits of Ms. Loomis’s friends and acquaintances in her adopted town. The French eat quite a lot of sugar, it turns out—which you wouldn’t think—and are very particular about cheeses, which of course you would think. And Sunday lunches last six hours, which sounds heavenly. In a French Kitchen is not to be taken as prescriptive, I think; most of us do not have access to the kinds of gardens, markets, boulangeries, and state-funded daycare that make possible the kind of cooking Ms. Loomis describes. In some ways, the book feels a little retro; Ms. Loomis notes approvingly how French women look great all the time, wearing high heels while they stir at the stove, while also noting, light as you please, that it’s the rare French man who cooks at home. Like I said, retro, and honestly a little grating when you factor in that Ms. Loomis never notes the social structures in France that (a) make it possible for people (read: women, mothers) to cook frequently and (b) make it seem like no problem that men aren’t expected to cook. In the end, though, In a French Kitchen is a book that makes you dream about retiring to France, eating your way through every recipe, and making every lunch a French Sunday lunch. 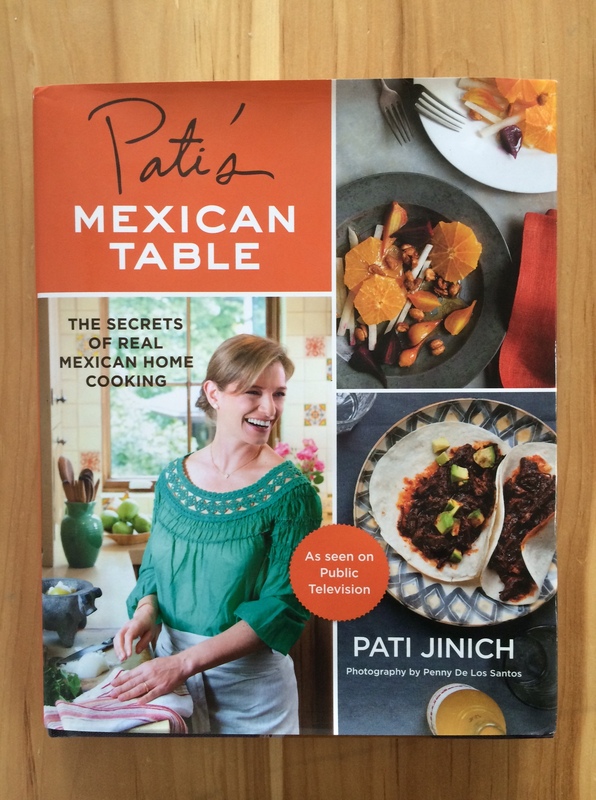 My other cookbook reading of late has been Pati’s Mexican Table: The Secrets of Real Mexican Home Cooking, by Pati Jinich. Ms. Jinich has a cooking show on PBS of the same name, which I’ve loved watching; her recipes look intoxicatingly good and Ms. Jinich is friendly, welcoming presenter. I’ve had my eye on the cookbook for months, and I happened to find a copy of it on sale at Sherman’s Books in Portland, Maine, much to my delight. It’s a great read, because there’s so much to learn about Mexican culture and food (Ms. Jinich’s grandmother was a survivor of the Nazi concentration camps, who combined her own food traditions with Mexico’s), and because Ms. Jinich provides plenty of tips about using ingredients that might be unfamiliar, like how to char poblanos or how to make tamarind syrup. I’ve made three recipes from the book and they’ve all been exquisite, requiring not even an extra pinch of salt. I’ve never had so much fun with a food processor. Try the salsa verde, and you’ll be looking in your local bookshop for Pati’s Mexican Table too. *I received a copy of this book from the publisher for review consideration, which did not affect the content of my review. Sounds delicious! I have quite a cookbook collection myself, although not enough time to cook very often (sigh). I go through phases in which it feels as if there’s no time to cook at all, and then all of a sudden that’s how I want to spend a weekend afternoon. Most of the things I’ve been making will keep for a few days, so I have a couple meals on hand for weeknights. That’s when I usually tend to cook, on the weekends. The French cook book looks especially nice. I have an excellent Mexican cook book, a little old, though. I’m glad to hear I’m not the only one who reads cookbooks for fun. I used to get at least one cookbook every Christmas or birthday, just to read. I stopped, though, because I had so many and didn’t use them as much as I should (mostly, I like to read them and look at the pretty pictures). I use them mostly for inspiration, and then make up my own recipes. Kind of weird. I just popped over to see your food blog – looks yummy! I’ve gotta try that avocado lime dressing! Thanks, Naomi! It was so fun while it lasted . . .
Oh, I love them! The guest book at our wedding was Nigella Lawson’s Feast — people wrote notes on recipes that looked good to them, and we even got a few family recipes too. 🙂 I’m the same way with cooking– I hardly ever follow recipes (baking is another story), but when it’s a new technique or new cuisine with unfamiliar proportions, I’m careful the first few times. I love finding out about new cookbooks. 🙂 I visited a friend today and happily browsed her extensive cookbook collection while I was there…such fun! Have you heard of Hugh Fearnley-Whittingstall? He’s quite well-known in the UK but probably not in the States. I use one of his books (River Cottage Veg Everyday) any time I find culinary inspiration lacking — I love his recipes! I haven’t heard of him, but I’m always happy to have a new recommendation! And I love recipes with lots of vegetables, so that’s even better! Thanks Grace! I love Joy of Cooking; also a huge Nigella Lawson fan. I don’t know Chef at Home but I will look it (him? her?) up. The Pati’s Mexican Table recipes are multi-step and not 30-minute-friendly (though there are a couple quick recipes in there), so we usually make one or two main dishes on the weekend and then eat them during the week. The chicken Tinga is easily two dinners, as is the ancho-citrus pork (oh my god so good). I’ve never tried Nigella. I think I should? What’s her best book? Well, I’m partial to Feast because we used it as our wedding guest book (and cook from it pretty frequently). But Nigella Fresh is great too. I will keep my eyes open!